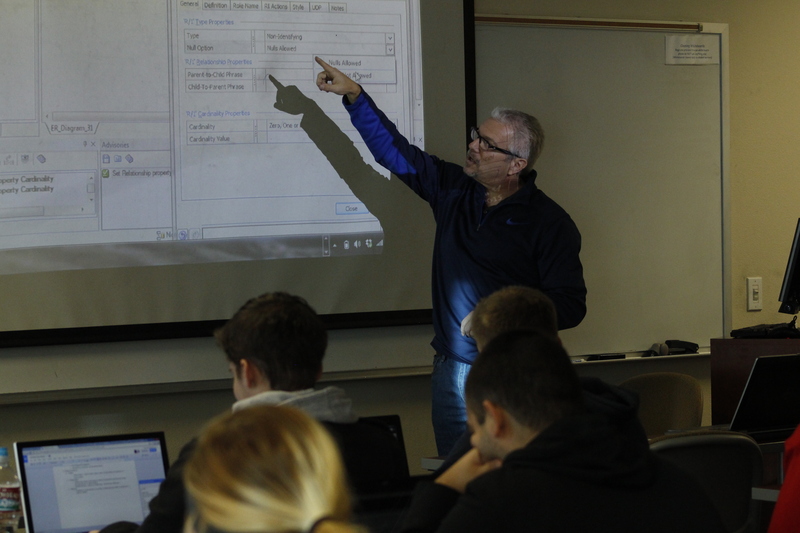 After working for Boeing on a B-1B bomber project and designing software for the state of South Dakota, Dr. David Bishop, assistant professor of software engineering at California Baptist University, brings more than 20 years of experience to teaching his classes. Bishop has been a faculty member at CBU for more than three years and said he has enjoyed the opportunity to mentor students through his engineering courses and by leading International Service Projects during the spring and summer. He took an interest in software programming after studying Bible and pastoral studies. He desired a more substantial means of providing for his family, found significance in developing new software and decided to pursue that as a career. Bishop said he believes that software engineering teaches important thinking skills in a precise way from which engineering and non-engineering students can both benefit. “From the latest military or scientific research equipment to the smartphones and computers we use every day, none of this would be possible without software design,” said Cameron Geiger, sophomore software engineering major. Geiger said that the software engineering field is about creating functional and efficient code for anything that uses electricity to run. Bishop’s “Intro to Computer Programming” class teaches students basic programming and delves into complex problem-solving methods. More in-depth classes such as “Database Systems” and “Software Construction” allow Bishop the opportunity to challenge his students to develop important thinking skills. Bishop said he is happy to share a wealth of knowledge with CBU students and is grateful to be given the opportunity to fulfill his dream of teaching.